Come Fly (by Night) with the TCTB as we tell you ALL about The Jungle Theater's current production (through July 23). Spoiler: The Twin Cities Theater Bloggers loved it! Cherry and Spoon raves: "Charming and funny yet poignant, with a fantastic score played by greats from the local music scene, and a cast that couldn't be better - what's not to love?" Single White Fringe Geek says: "If 'well-produced new romantic musical comedy' is all you need to hear, by all means go, you won’t regret it." Twin Cities Stages: "Fly By Night is an extremely touching show about the connections between people and searching for what you love. It just might be the perfect summer musical." 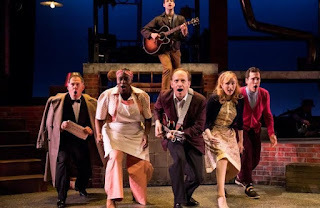 Twin Cities Arts Reader: "While the mixture of music, froth, and heaviness in Fly by Night may not work seamlessly, it weaves a magical web of instants and moments and generates the sense of wonder we hope to find at the theatre."